We have turned up all types of family objects in the process of selling mom’s house. The kitchen turned up favorite cutting boards and a small pan for cooking poached eggs belonging to my grandfather. Cookbooks with parts collected from trips to the grocery store were boxed up to save. In the process of looking for a special hand painted Santa candy dish, I dove deep into the hall closet pulling out all the boxes. Mom mentioned a box in the back that held my grandfather’s paperwork. I spotted it tucked in the very back and pushed my way into the narrow space and drug the box out. To my surprise it contained, not paperwork as my mother remembered but old photos, many of my grandfather’s parents and baby photos of my grandparents. One of my favorites was of my great grandparents, George Arthur West and Josephine S. Davis, taken in 1899, shortly after their marriage, as was noted on the back by my great grandmother. 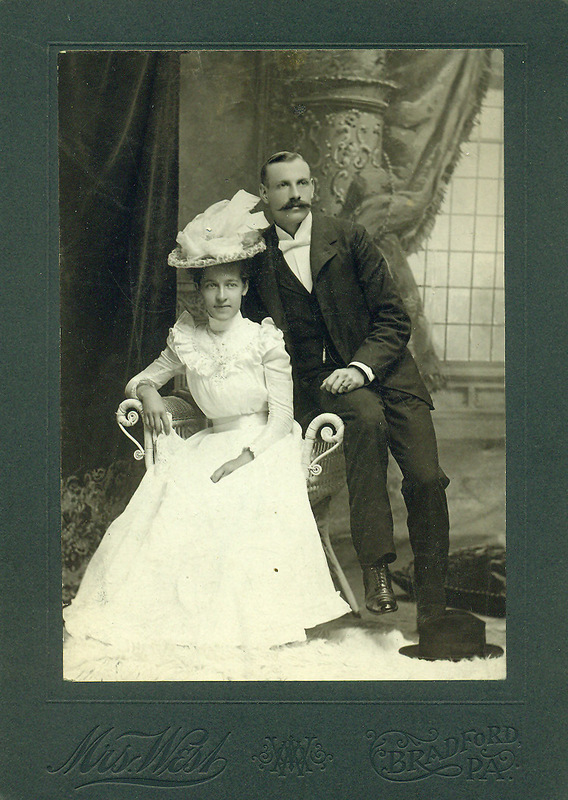 Married February 18, 1899, in Bradford, Pennsylvania, the photo was taken by Mary Zuver West, George’s mother.